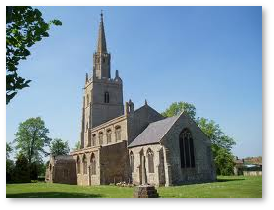 St George's church, with its distinctive tower, is located in the heart of the village of Methwold on Crown Street, next to The George pub. The Church is usually open every weekend during daylight hours. Sunday's we usually celebrate the Eucharist together at 9.15am. On Tuesday and Thursday mornings we usually have a service of Morning Prayer (BCP), often held in parishioners' homes. See our worship section for further details. Worship: Services are taken from the Church of England's Common Worship. On Sunday's we usually celebrate the Eucharist together. Bimonthly, we have a service led by a local Methodist Minister. Hymns are usually accompanied by recorded organ music. The Eucharistic prayer is usually said, rather than sung. The congregation currently numbers between 8 and 14 but, on high festivals such as Christmas, Easter and Harvest, the numbers are much increased. Music: The Church has an organ, but no regular organist. Hymns are taken from Hymns Ancient & Modern and New Hymns and Worship Songs. Bells: The tower used to contain six bells, four of which date back to 1630 and the other two from 1778. The tenor bell weighs over 12 cwt. In 1999 these bells and two new ones were rehung and dedicated in time for the Millennium celebrations and are now rung regularly after forty years of silence. Church activities: Apart from occasional coffee mornings and Ritz Tea's, the PCC organises various events including a Harvest Supper, various musical concerts, Carol Services, Christingle, special Holy Week Services and Songs of Praise, these last proving very popular. Although the congregation is small in number, church fund raising events are readily supported by the village as a whole. Duchy of Lancaster Primary: The church has strong links with the village Church of England Primary School. Our local Priest takes regular assemblies and visits the school and the school come to special services in the Church, usually based around the major Christian Festivals. Friends of St George's: There is a very supportive friends group which supports the activities of the Church and helps us maintain the excellent condition of the church building. It is based on a yearly subscription for which Friends receive various benefits, such as the annual BBQ and invitations to special events. Please contact our Church Warden, Nick Guyer, for more information (01366 727293). History & Fabric: St George's church is a Grade One Listed Building, situated in the middle of a conservation area. The first church was built on the site in the 1200`s. It was a Gothic “Decorated” church. Within the first 100 years the body of the church was destroyed by fire and the present nave, with its enlarged aisles was built. The original east walls of the “Decorated” aisles are incorporated in the present ones. The only parts of the original church to survive are the chancel, the chancel arch and the tower. The east window still displays the original tracery. During the rebuilding of the nave in the 1400s, Gothic “perpendicular” windows were inserted in the sidewalls of the chancel and the ground floor of the tower. At the same time, an octagonal corona and a long, thin spire were built on the tower. The design was probably inspired by the belfry of Bruges. When the Bruges spire burned down, it left the spire and corona of Methwold unique in the world. English Heritage recently contributed 60% to the cost of extensive repairs to the stonework of the tower, corona and spire. The church contains many carved works on the stonework and the opinion is that half were carved by a conventional, ecclesiastic, carver, the others by an irreverent joker. A lot of fun can be had when studying the carvings carefully. The church clock is a fine example of 17th century workmanship and has an unusual continental style pin-wheel escapement. An interesting feature of the clock is the spring, which supports the pendulum — this is an ordinary kitchen knife (complete with handle) which was fitted by Mr Fred Merrick in about 1934 and still works perfectly. The clock has ticked away contentedly to itself virtually undisturbed for over three hundred years, but sadly in 1999 the clock had its weights and most of its winding gear removed and replaced by two electric motors. In doing this, the clock has been robbed of much of its unique character. In the north aisle is a brass of Sir Adam de Clifton which has a sad history. Legend has it that in 1680 a rogue sexton sold Sir Adam`s brass to a passing tinker. Eventually the tinker was found and the parts of the brass, which had not been sold, were recovered, only to rest in the parish chest for two centuries. In 1860 the new incumbent John Denny Gedge, with some help, remounted the brass on the wall where he now stands minus various parts.